inscription: Bottom right corner of drawing has "Owns the Sabre (c) 1988" printed in black. Poster has red background with a yellow square in the center with an image. In the yellow square is a native man running with a stick raised next to a buffalo. Above the center square is, "Chicano Mexicano Indigena." On the left side is "1492 500 Anos de Resistencia Intercontinental." 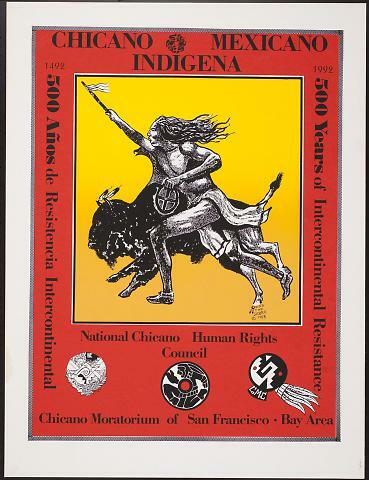 On the right is 1992 500 years of international resistance." Below the center square is "National Chicano Human Rights Council/ Chicano Moratorium of San Francisco - Bay Area" with three circle symbols in black and white.